McRoskey Mattress Company’s mission is to support the well-being of its customers through life-changing sleep. Founded in 1899, McRoskey Mattress Company has brought premium mattresses and box springs to the Bay Area and beyond, since its founding in San Francisco. With a dedication to quality, every McRoskey product is created by craftspeople using time-tested construction techniques passed down through three generations of family ownership. In the late 1800’s, the McRoskey brothers, Edward and Leonard, moved from Chicago to San Francisco to sell mattress manufacturing equipment. They arrived in the middle of a nationwide economic shock and discovered that there weren’t many mattress manufacturers in the area, and decided to set up shop making mattresses themselves. They established McRoskey Mattress Company in 1899, with a small factory in a rented space on Sutter Street. They moved to a showroom and factory on Harrison Street sometime before the Great San Francisco Earthquake and Fire of 1906. Because the neighborhood was spared the inferno’s flames, the disaster ended up being good for business, as many San Franciscans needed to replace their incinerated beds. According to family lore, the lines were around the corner for several months after the earthquake at the Harrison Street location. 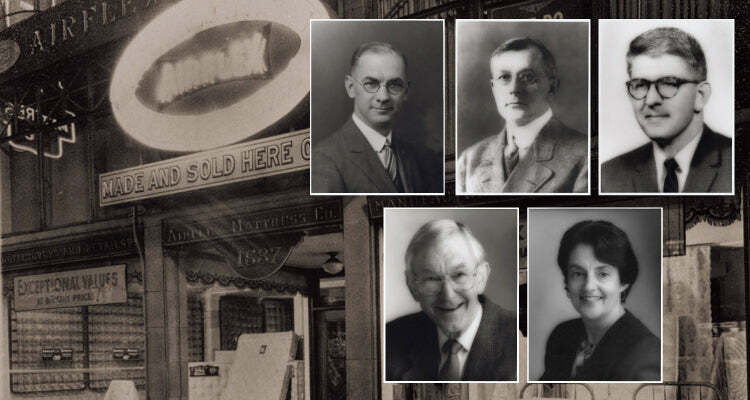 In the 1920s the two brothers became competitors: Leonard continued to operate McRoskey & Co. while Edward opened his store at 1506 Market Street under the name of Edward L. McRoskey Mattress Company. In 1925, Edward built a new factory and showroom at 1687 Market Street where the company continues to retail today. He was very forward-thinking with the building’s construction and design, it was built out of reinforced concrete to help it withstand future earthquakes. In 1929, Edward’s brother Leonard passed away and his business was closed. On May 1, 1931, Edward L. McRoskey filed for his first patent for the McRoskey Tufting Machine, designed to help make the tufts stronger and requiring less needle work from the mattress makers. He later refined the process and invented a button threading machine that added buttons to mattress tufts. Additionally, he improved tufting even further by inventing a hand tool to be used for tufting, eliminating the need for a long upholstery needle and increasing the resiliency and springiness of the premium mattresses. Robin McRoskey Azevedo, president and third-generation owner of the McRoskey Mattress Company. A woman in a predominantly male industry, she shifted the company focus from solely manufacturing, to building customer relationships; building the McRoskey brand from San Francisco’s best kept secret to a nationally recognized brand synonymous with quality sleep. Robin is a founding board member of SF Made, and is a passionate champion of local US manufacturing.